This sort of thing is my bag, baby. 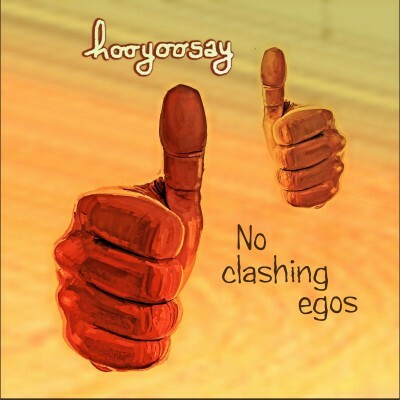 No Clashing Egos is a full length album from a musical project known as hooyoosay (they prefer not to be referred to as a band or be credited individually.) The music speaks for itself though. The album is quirky, fun, and avant garde. Unlike a lot of experimental music artists, these guys can actually play their instruments, sing and put together some really impressive arrangements. They remind me of a bit of The Aquabats, if you were to replace the SoCal ska element with a roots Americana vibe. These songs are also a little bit more artistic and abstract. It’s like if you combined 1940s-1950s stage musical acts with contemporary synths, beats and a hodgepodge of other instruments. No two songs on this album are the same, which ultimately makes genre classification challenging. There’s an endearing mix of comedy and sincerity in the lyrics, in the same way that dialogue in a play or a song and dance number in a musical can present as “goofy” but still convey genuine emotions and explore substantive themes. As the title implies, No Clashing Egos disarms and dazzles the listener with its whimsical innocence. My favorite song on this album is Mountain Air, which is a 60′s style psychedelic, indie pop masterpiece. These guys (and girls) are great. I love this!